Alisia’s travel theme of the week is texture – what fun. I have been going through my photos taken during our trip to the Maritime Provinces of Canada and wondering how to use those that I enjoy but haven’t fit into any of my themed posts. Enter Alisia’s theme. I love this one because of the various textures that frame the texture of the jutting rock. 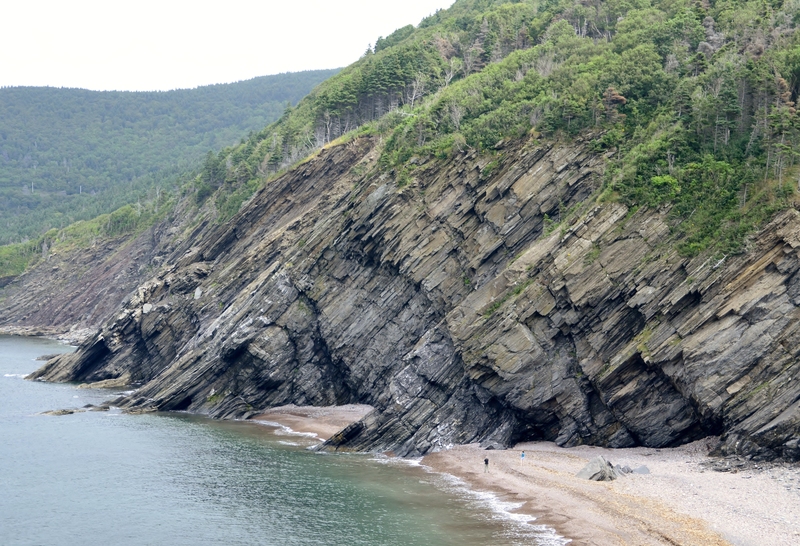 This was taken at Meat Point at the north end of Cape Breton Island, Nova Scotia. Of course in the Maritime Provinces, the primary themes are the contrasting textures of land and water. 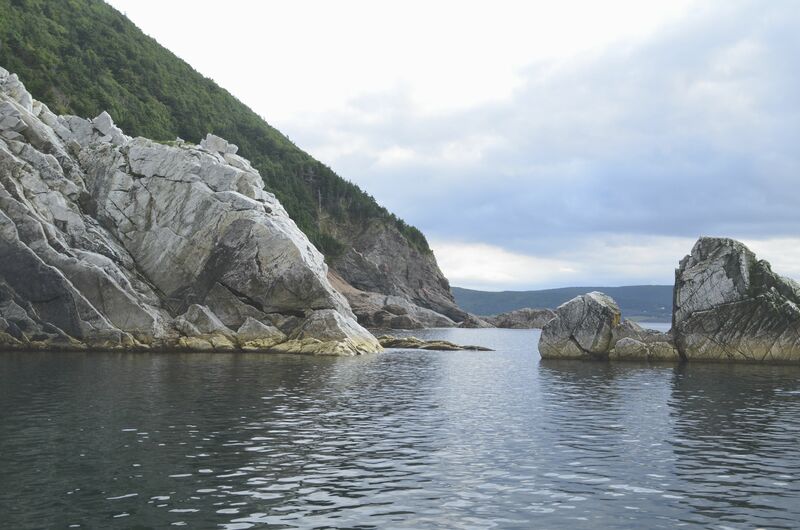 The next two Photos were taken from a boat off of North Point at the northern most part of Cape Breton Island. In these photos, the textures of land and water meeting is deceptively calm, but the hardness of the rock says that it can meet the force of water with firm resolve creating a tempest of texture in our imagination. 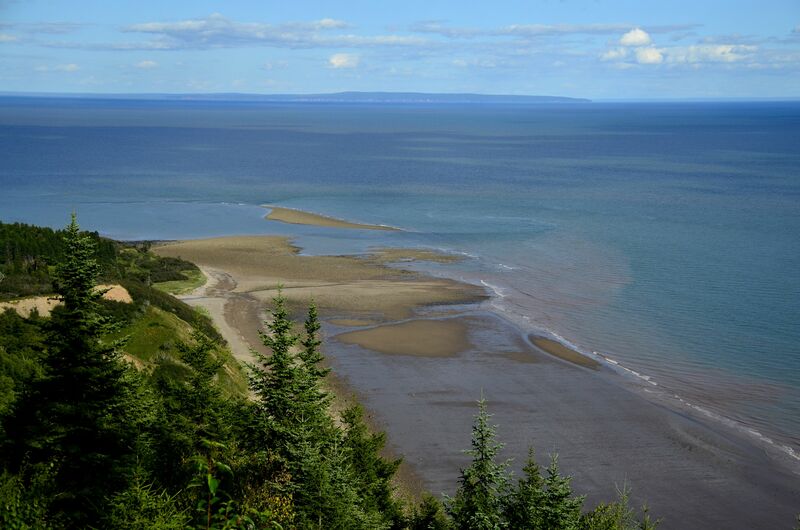 The next photo is from the mouth of the Bay of Fundy when the tide is going out. The color created by the varying depth as the water level lowers creates new textures on the water. How much softer the meeting of land and water is here. 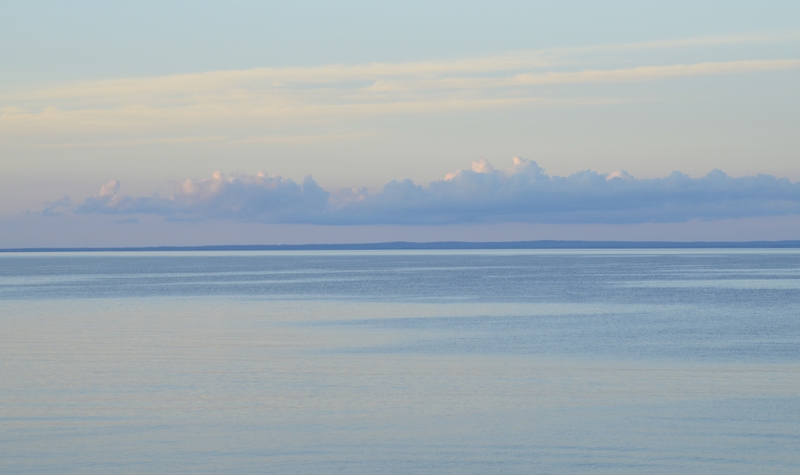 This last scene is of the mouth of the Saint Lawrence River in Quebec. The soft textures of sky and sea meet with only a hint of land between. Love your photos that represent texture. Those rocks are amazing. Great choices for the challenge. I frequently had overcast skies so I was pleased when the light was good. We saw some amazing scenery. Thanks for taking a look and leaving your comment. I appreciate it. Truly fabulous photos Pat. I feel lost in nature when I look at them. The colors, the perspective and the variety of locations give me a feeling of being right there with you. And I can see some pretty wonderful talent in you with that camera. Thank you so much – your comment means a lot to me. I am absolutely loving my camera and I am seeing the world so much differently now. And what is amazing is that I don’t use auto any more. Of course I’m still making tons of mistakes but I figure if I try enough different things, one of the photos will be good. It’s also fun that I’m beginning to understand what I’m doing and adjusting settings intentionally. 🙂 Thank you so much for your support, in comments and with your blog, of people who want to be nonprofessional photographers. Thanks. 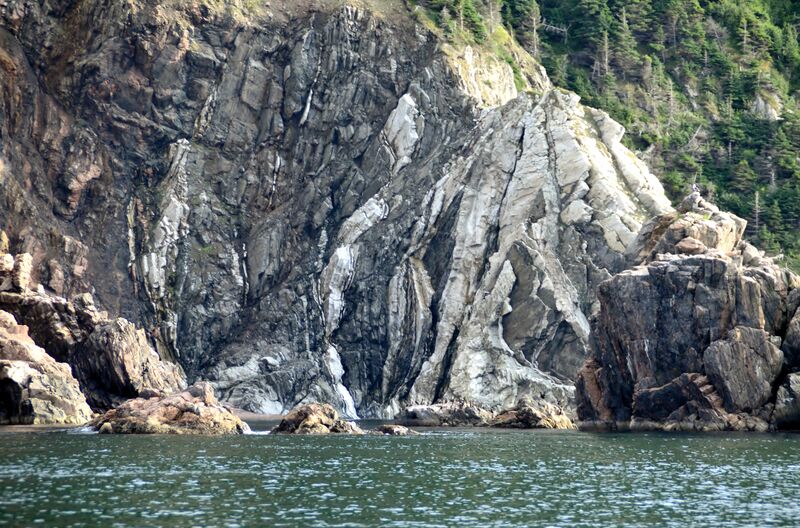 We didn’t get to spend enough time at the Bay of Fundy. We spent time there 30 years ago and it is one amazing place. I have another post from there that I’ll get to next week. Glad you checked my post out. Thanks so much. I appreciate your feedback – it means a lot to me. Nice post! I especially like the shot with the tide going out. Thanks. I like that one, too. It was a beautiful day for seeing the various colors of the water, especially contrasted with the sand on the beach. Thanks for visiting and your nice comment. Means a lot to me. Cape Breton has featured in books I have read, and it is wonderful to see photos. Have you read Alistair Macleod’s No Great Mischief? I am not sure if cape breton features, but i think it might. It is really a beautiful place, Isobel. I haven’t read Macleod’s book but I will look it up. It is so much fun reading books that take place where we have been. I am reading Laurie King’s series about Mary Russell who is the female associate of Sherlock Holmes. Love the juxtapostion of land against the sea. Wonderful.